I flew back from New York a little earlier than I would normally on Saturday for one reason and one reason only - a rare appearance from conductor Simon Rattle on the podium of the Los Angeles Philharmonic. It wasn’t always this way. 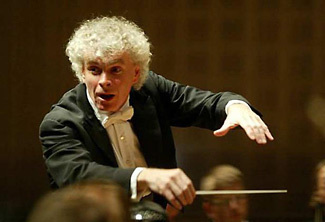 Rattle, perhaps one of the most highly regarded conductors in the world, made his first appearance with the L.A. Phil in 1979 and was Principal Guest Conductor here during the 1980s and early 90s. But in case you hadn’t noticed, those days are long gone and despite a close relationship with our local orchestra in the past, Rattle hasn’t performed with the orchestra now in over a decade and has only performed in Walt Disney Concert Hall on one prior occasion since it opened, with the Berlin Philharmonic during the inaugural season. Whether or not the L.A. Phil audience still feels a connection to Rattle is unclear. But there is no doubt that these performances were much anticipated regardless given his reputation and a serious, well-chosen program. It turned out to be among the two or three best shows they’ve given all season. The evening started with an unusual pairing, that wound up making lots of sense. Ligeti’s Atmospheres and its rising discordant tones segued into the prelude for Act I of Wagner’s Lohengrin. Wagner’s music always sounds surprisingly contemporary especially when paired with later 20th-century works, and the relationship here in terms of color and sound that seems to coalesce out of thin air from a distance, taking shape as something much greater, was consistent through both pieces, played here without intermission. Immediately after this, Rattle and the orchestra added voice to the mix in the form of mezzo Magdalena Kožená, Rattle’s wife. She often performs alongside him, and her appearance was a welcomed bonus. She performed Mahler’s Rückert-Lieder, and, having just heard some of these same songs performed by Matthias Goerne and Leif Ove Andsnes last week, I was taken by the difference. Goerne’s rich warmth gave the songs, and particularly “Ich bin der Welt abhanden gekommen” a painfully melancholy feel. Kožená's voice, of course, is quite different, and her penetrating and exacting dark sound gave off a very different air making the protagonists of the song sound almost maniacal in their perceived separation from the rest of existence via love. Kožená is a great artist and she gave Mahler’s song the grand scale they deserved with rich, textured support from the orchestra. But now came time for the orchestra to shine with Bruckner’s unfinished Symphony No. 9. It’s a big, sometimes brutal piece that can be both dark and even angry at times. There’s been a fair amount of late Bruckner on offer here in L.A. in recent seasons. The 9th was last performed here in 2009 by a touring Vienna Philharmonic under Zubin Mehta. Rattle managed an emphatic but well controlled performance from the orchestra. The winds in particular contributed great things throughout these brooding, sometimes troubled movements. While many of the players may have been new faces for Rattle, he was clearly connecting with them in some of the loveliest playing they’ve delivered all spring. As to whether what follows from here lives up to this level will need to be seen, but hopefully Rattle’s face will once more be a familiar one around these parts. It would be great to get to know him once again. This was a wonderful concert -- one of the best I've heard in a long time at Disney -- and it was great to see Sir Simon back with the Phil. He actually had them sounding like a deeply polished, European orchestra with a rich string sound. Kožená was lovely as well. Naturally, I wish that Rattle was our music director. But then again, so does Philadelphia, and Boston, and a number of other orchestras in the world.